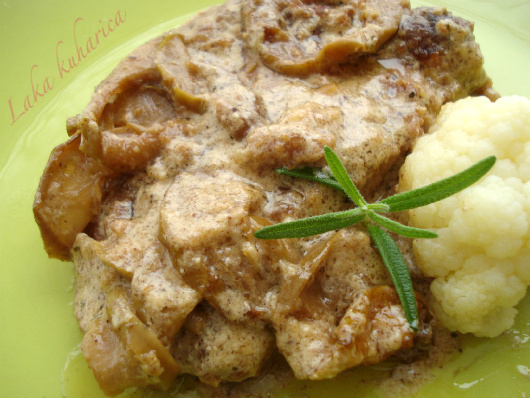 Creamy and light pork steaks with apple chips sauce. Best served with cooked bulgur, rice or barley. In a shallow dish, stir together egg, water, rosemary, black pepper, and garlic granules. Put the bread crumbs in another dish. Dip pork steaks into egg mixture, coat with bread crumbs. Brown steaks in butter and oil for 5 minutes on each side. Remove, place in a baking dish. In the same skillet stir in apple chips, sour cream and bouillon, cook briefly. 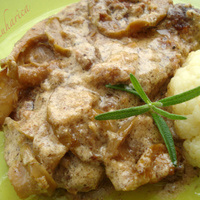 Pour the sauce over pork, cover the and bake in oven at 170°C for 45 minutes.